The article attempts at an interpretation of Józef Andrzej Załuski’s Przypadki niektóre […] (Several Cases […]). The Kiev bishop, known primarily from his social and cultural activities, was in the year 1767 imprisoned and sent to Kaluga by order of Nicolas Repnin. The analysis of the piece, the composition of which was influenced by the experience of captivity, is scarcely present in the state of research, and allows to disclose various modes of the author’s self-presentation in old literature as well as sheds new light on Załuski’s literary creativity. Taking advantage of the tools offered by modern humanities and respecting the role of tradition and the specificity of Old-Polish epoch and Enlightenment, it offers an opportunity to reflect upon pre-romantic awareness of exile. The article refers to a brief episode connected with Józef Ignacy Kraszewski’s trip to Italy contained in his Kartki z podróży 1858–1864 (Notes from Travels 1858–1864), namely to Pompeii. Pompeii was a place of numerous romantic travels which explored the faces of the fall of the civilisation and passing of human achievements. Kraszewski did not make it a secret that it was Pompeii, alongside to monuments of the first centuries of Christianity, that became the central point on the trace of his grand tour. Significant here is the fact that for Kraszewski this type of epistemological behaviour, marked by voracity, makes room for a gesture of choice and a consciously deep reflection which, paradoxically, in a great cemetery seeks for tracks of life and old splendour as well as active creation. The article is an attempt at reading Henryk Sienkiewicz’s private and journalistic correspondence from America through the prism which merges two topics: geography and identity. The particular official and unofficial letters are seen in this view as a record of a special self-project of identity whose efficacy of impact on the receiver resulted from the writer’s skillful combination of fact-collecting with fiction-writing. The fragment of the novel by Jean Paul Richter Siebenkäs (Blumen-, Frucht- und Dornenstücke oder Ehestand, Tod und Hochzeit des Armenadvokaten F. St. Siebenkäs im Reichsmarktflecken Kuhschnappel <Flower, Fruit, and Thorn Pieces; or, the Married Life, Death, and Wedding of Siebenkäs, Poor Man’s Lawyer>,1796–1797), known as The Atheist’s Dream, the full German original title being Rede des toten Christus vom Weltgebäude herab, dass kein Gott sei (Speech of the Dead Christ from the Universe that there is no God), presents one of the most important romantic night-visions: in metaphysical dimension it presents a terrifying Apocalypse without God, and a luciferic destruction of cosmic perpetual matter; in aesthetic dimension it indicates a triumph of liberated phantasmagorical imagination. Intentional or accidental traces of “Jean-Paulian night” are found in the works of Fyodor Dostoevsky (Ippolit’s “confession” from The Idiot, 1869; the short story Bobok, 1873), in the short story by Bolesław Prus (Pleśń świata <Mould of the World>, 1884) and in Thomas Mann’s (Castorp’s “snow” vision from Der Zauberberg <The Magic Mountain>, 1924). Eschatological or cosmic visions of the characters (narrators) produced as a result of demonic temptation of imagination present a dehumanised world of chaos and death subordinated to biological determinism and, as in Jean Paul Richter, constitute a kind of worldview shock autotherapy. India in “Pożegnanie jesieni” (“Farewell to Autumn”): a Promise of Liberation or Witkacy’s Intelligent Derision? The article seeks to analyse the importance of Indian motifs in Stanisław Ignacy Witkiewicz’s Pożegnanie Jesieni (Farewell to Autumn). It starts with claiming that while India and its aspects are depicted in a very general and sometimes erratic way in the novel, Witkacy’s Farewell to Autumn cannot simply be summed up using Edward W. Said’s (and Erazm Kuźma’s) method. India, and the East as such, is described here neither as a simple mirror image of the West nor any myth of it being construed. The author’s conclusion is that rather with treating the vision of the East, the novel deals much more with the image of certain Europeans fascinated with the East. In his opinion, Hela’s conversion to Buddhism, a crucial point in novel’s plot, is indicative of it. However, following Jan Tuczyński, the author finds it possible that the final moment of the book, Atanazy’s death, may point out to setting a common ground between elements of Witkacy’s philosophy and a certain concept from Indian classical schools of thought. If that be the case, Witkacy might have meant that a true dialogue between the West and the East should be based not on a superficial, ‘spiritual’ journey to the East, but on a meaningful philosophical search to find shared elements in Western and Eastern schools of thought. The study analyses a peculiar connection between La Croisade des enfants (The Children’s Crusade) and Bramy raju (The Gates of Heaven), and shows their contexts, being a differentiated historiographic and literary accounts about the 13th children pilgrimage to the Holy Land. The first part of the paper discusses the poetics of The Children’s Crusade and Schwob’s creative technique, e.g. perspective of capturing the reality and a new quasi-messianic project of history writing. In the second one, the author focuses on disclosing the problems of The Gates of Heaven through the prism of Michel Foucault’s concept of “pastoral power,” Giorgio Agamben’s notion of profanation, and gender theory. The subject of interest in the third part is so far unpublished Andrzejewski’s homosexual notes, seen by Andrzejewski himself as seminal for understanding the novel’s ideological significance. The article attempts to analyse a fragment of the novel Henryk Flis, most representative of Stanisław Antoni Mueller’s lyrical prose. In the line of reasoning, it points at numerous similarities between Bruno Schulz’s modernist-symbolic language and Mueller’s conception. Exploiting the romantic topoi of romantic space of internal landscape, on the level of fiction Mueller composes an image of childhood memory which, referring to the Latin term “in partibus infidelium”, is called ‘in the regions of infidels.’ Essential for the dynamics of the entirety of images are first and foremost the topos of “world-gone-awry,” daredevil concept of speed, theatricalisation and ironisation, as well as the motive of deluge seen as a transposition of private semantic catastrophe. A constant fluctuation of lyricised space is treated as a crucial component of the protagonist creation who is an ironist in Kierkegaard’s view, a melancholic (in that it contaminates aquatic motifs ascribed to the topos of Saturnalia), as well as Schulzean child-creator (demiurge). It must, however, be borne in mind that on the global level Mueller’s narration is merely incrusted with poetic fragments. They are an immanent feature of Schulz’s creativity in general. 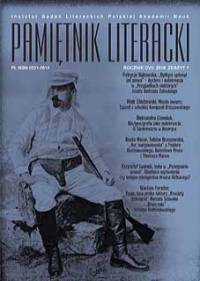 In the article, as based on the examples of Jan Brzechwa’s tales translations, the author makes an attempt to assess the publication of Lviv’s publishing house Vydavnytstvo Staroho Leva entitled Na zemliakh Berhamotakh (On the Islands of Bergamuts). The paper starts with an analysis of the Polish original poems and their translation into Ukrainian by Neonila Stefurak, to present her creativity and methods of translation. Subsequently, referring to illustrations enclosed into the book, it portrays the artistic style of Oleh Petrenko-Zanevs’ki whose drawings are an inseparable element of the edition, influencing both the reception and the interpretation of the literary text. The presented correspondence includes 15 letters by Jarosław Iwaszkiewicz and 17 by Antoni Małłek from the years 1907–1910 and two letters by both correspondents written after a break of a dozen of years or so in 1926. The core of the set of letters come from Orchard Lake Schools in Michigan collection and was produced in Iwaszkiewicz’s early life while his stay and study in Yelisavetgrad and Kiev. The future writer’s addressee is Antoni Małłek, an American of Polish origin living in Mt. Pleasant, Pennsylvania, a few years Iwaszkiewicz’s senior stenographer, bookkeeper and medical student. Apart from being testimony of Iwaszkiewicz’s early life, his emotionality, character, dreams and expectations, the letters provide with facts so far undiscussed by biographers, such as the writer’s sister Anna of Iwaszkiewicz Krzeczkowska’s marriage. Most probably, after the exchange of letters in the year 1926 the correspondence was not maintained. The author analyses 107 letters written in German which make up Józef Wittlin’s correspondence with Walter Landauer, an editor of Allert de Lange publishing house, where in the year 1937 a German translation of Józef Wittlin’s Sól ziemi (Salt of the Earth) was released. The letters cover the period from January 1936 to March 1940 and they lack letters from the years 1937 and 1939. The preserved pieces refer mainly to the circumstances of publishing Wittlin’s book in German, but also contain pieces of information about the wirter’s biography from that period. The article briefly presents the war fortune of the two correspondents, namely Wittlin’s departure from Europe and the beginning of his stay in the USA, and Landauer’s desperate attempts to flee from Holland which ended with his capturing by the Nazi and his following death in Bergen-Belsen Nazi concentration camp. To add, the paper presents a fragment of the then literary life in Europe. Wittlin’s book achieved a great artistic and commercial success, Allert de Lange publishing house made a contribution to emigration literature of 1930s, and Landauer is an example of a publisher who not only in exemplary fashion fulfilled his professional obligations, but also reveal his unbiased interest in the problems of the authors with whom he cooperated. The review discusses Lidia Wiśniewska’s book Między Bogiem a Naturą. Komparatystyka jako wizja kultury (Between God and Nature. Comparative Studies as a Vision of Culture). It touches upon the problems referring to the current debate over the future of the humanities, and especially to the questions about the research tools which allow for adequate depictions of cultural matters both in diachronic and in synchronic perspective. The author offers investigation of human creations of the West as symptoms of two separate though interacting mythical and paradigmatic patterns which she calls myth of God and myth of Nature. Analysing selected literary texts from various epochs, the author shows the dynamics of tensions between the distinguished myths and paradigms. Conclusions drawn from the analyses lead the researcher to the concept of comparative studies understood as a philosophy of cultural processes. The text is a review of Edward Balcerzan’s book Pochwała poezji (Praise of Poetry), a literary historical study of 20th century poetry, a private description of the history of Polish school of structuralism, as well as a poet’s and a literary scholar’s methodological manifesto. Interpretations and critical opinions included in the publication make up a defense of innovativeness and literariness, together with apology of art of words and the author, but first and foremost revive the structuralism/post-structuralism dispute and enter into dialogue about the borders of modernity. The review discusses Pierre Piotr Bilos’ book on the experience of exile established in the pieces by Witold Gombrowicz, Gustaw Herling-Grudziński, and Czesław Miłosz. The author treats this experience as a figure of modernity, which allows to formulate a thesis about the universality of the considered literary works that gives them a European (global) dimension. Geography – a Science or a Story? The review discusses Yi-Fu Tuan’s book Romantic Geography which juxtaposes a scientific and literary (“romantic”) approach to geography and raises the problem, vital also for literary studies point of view, of the role of story in geography. The presented view secures geography from excessive theorising and may also be inspiring for scholars. Tuan’s book does not strive to a monographic depiction of the subject, but is an essay which in quite a general way sketches the concept of romantic geography. The review refers to Elżbieta Rybicka’s book Geopoetyka. Przestrzeń i miejsce we współczesnych teoriach i praktykach literackich (Geopoetics. Space and Place in Contemporary Theories and Literary Practices, 2014). The reviewer in a concise way discusses the main research directions within geopoetics and spatial and topographical turn. Rybicka’s proposals are set in the context of Kenneth White’s and Anna Kronenberg’s geopoetic considerations.